The Wi-Fi alternative tech, Li-Fi, has finally been tested in a real world setting, where it was reportedly able to send data at speeds 100 times faster than current Wi-Fi tech. According to IBTimes, Estonian startup Velmenni, which has developed smart LED bulbs that can implement Li-Fi tech, is testing the tech in offices and industrial settings. During pilots tests, Velmeni was able to send data through the Li-Fi touting light bulbs at up to 1GBps, which basically equates to downloading a HD film in a just seconds, according to the report. "Currently we have designed a smart lighting solution for an industrial environment where the data communication is done through light," Deepak Solanki, CEO of Velmenni, told the publication. "We are also doing a pilot project with a private client where we are setting up a Li-Fi network to access the internet in their office space." 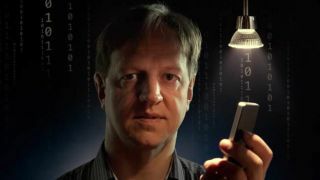 Invented by Professor Harald Haas from the University of Edinburgh, Li-Fi, or light fidelity, transfers data over the visual spectrum rather than via radio waves. It uses light bulbs that flash on and off exceptionally quickly, sending binary information to a recipient. The fastest speed on record for the tech in a lab setting had been 3Gbit/s during the development of the tech, but two years ago, researchers began using specially developed LED bulbs that could separat the light into parallel streams, to triple the speed. While these speeds are impressive in a lab setting, until now, results of Li-Fi tech in a real in a real world setting hasn't been really revealed. Haas believes Li-Fi could eventually be used to power a future generation of network in conjunction with Wi-Fi, providing more consistent coverage within buildings, as well as making for a potentially more secure network as Li-Fi can penetrate walls.